Morons ... though I wish they were right about ALAC. To throw a bit of a wrench into the WMAL results, according to this MSDN article, it would appear that the performance/efficiency ratio for WMAL encoder changed between Vista and Win7. Did anyone try testing with both versions to see the difference? Did anyone try testing with both versions to see the difference? Yes, indeed. 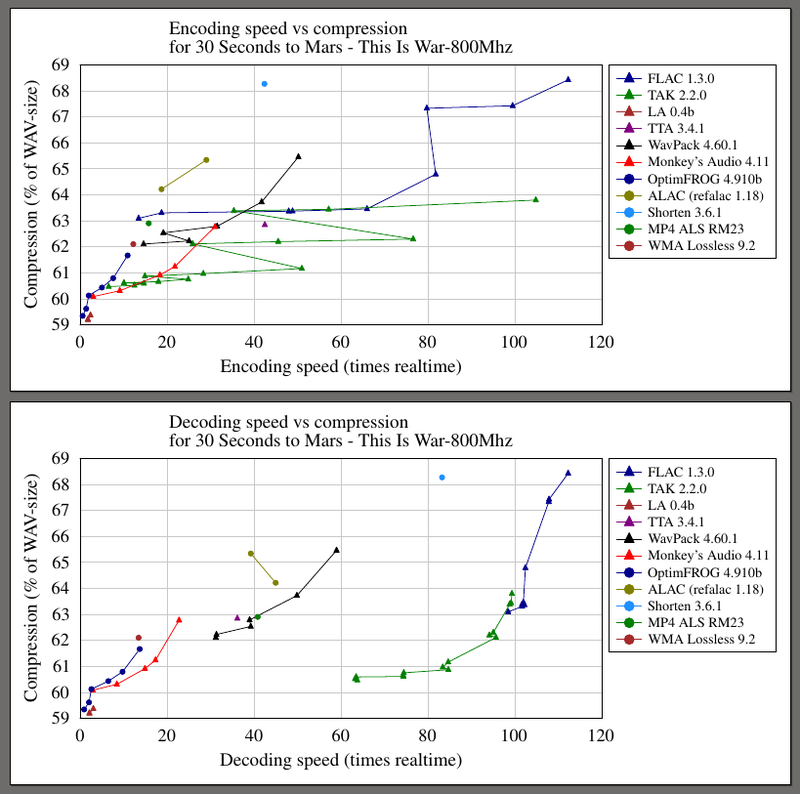 I've had some unpublished results from a Windows XP system which I planned to use for the third revision of this lossless codec comparison (I switched to a Windows 7 system shortly after), but I noticed that WMAL was indeed much more competitive (but quite slow in decoding) in earlier Windows versions. As you can see, WMAL was in a very different spot comparing to where it is in my recent results. Thanks for the report! I started a discussion with lvqcl about potentially changing the default complexity value for WMAL in wmaencode.exe, as I'm guessing most people on HA would prefer higher compression ratios over faster encoding times. To be honest i doubt the typical HA member will use WMAL at all. No matter how it compresses. but I noticed that WMAL was indeed much more competitive (but quite slow in decoding) in earlier Windows versions. From my old tests (about 5 yesrs ago) on WinXP: WMAL compression was somewhere between Monkey's Audio fast and normal, en/decoding speed is slower than Monkey's Audio high. Just as in your graphs.